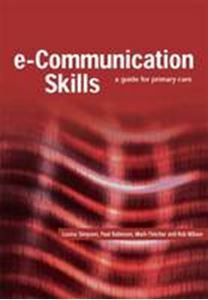 Quick overview A patient-centred approach to e-communication that can serve as a reference guide. This book covers potential issues, considering both clinical and non-clinical settings, and is also a very useful teaching resource. It adopts the approach that communication is the responsibility of everyone in the primary care team, and aims to help everyone. This is a practical, easy-to-use, patient-centred approach to e-communication that can be read from cover to cover, or dipped into as a quick reference guide. It covers potential issues both internally (patients and practice) and externally (the primary care trust and the wider community) and considers both clinical and non-clinical settings and is also a very useful teaching resource. e-Communication Skills adopts the approach that communication is the responsibility of everyone in the primary care team, and helps everyone to play their part. This is an important book for healthcare professionals in primary care, including administrators and communications managers. It is also vital for healthcare e-organisations such as web based information services and networks, and policy makers and shapers.